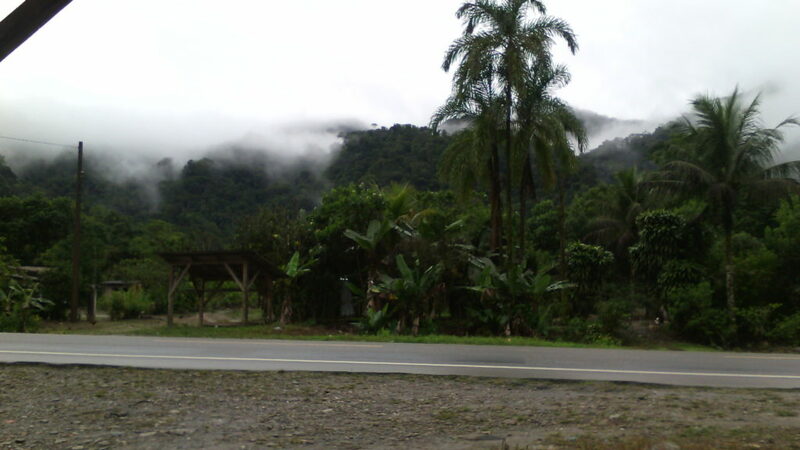 This was my first encounter with the jungles of Bolivia. Humidity, high temperatures, mosquitoes all over the place and a dense forest full of life. I had left behind what it felt like home and moved towards lowers lands. For the first time after a long time I had gone down to the valleys and said goodbye to the mountains and the altitude. The Andes were now far behind. They were above again, amongst white clouds that covered the forests. I was on my way to Puerto San Francisco to find out about a boat to sail the rivers. 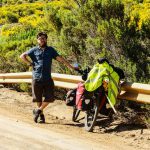 I spent over a month in Cochabamba. Juli allowed me to stay at her place a bit longer than what I had thought. Quite a longer time to be honest, but no regrets at all. 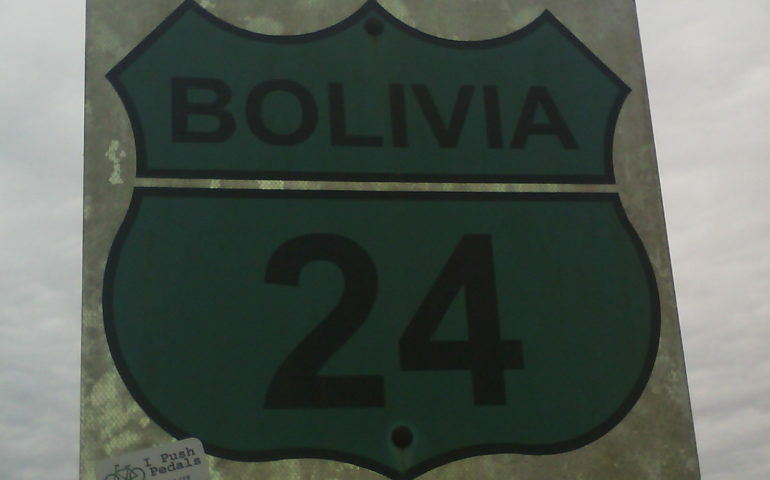 In the time spent there I learned a lot about Bolivia thanks to her and other cyclists that passed by. Among the many of the things that we did in Cochabamba, one of them was planning on finding out if it was possible to take boats to move through the rivers of Bolivia further north; El Beni. A region closer to the amazonas and quite isolated from the rest of the country. 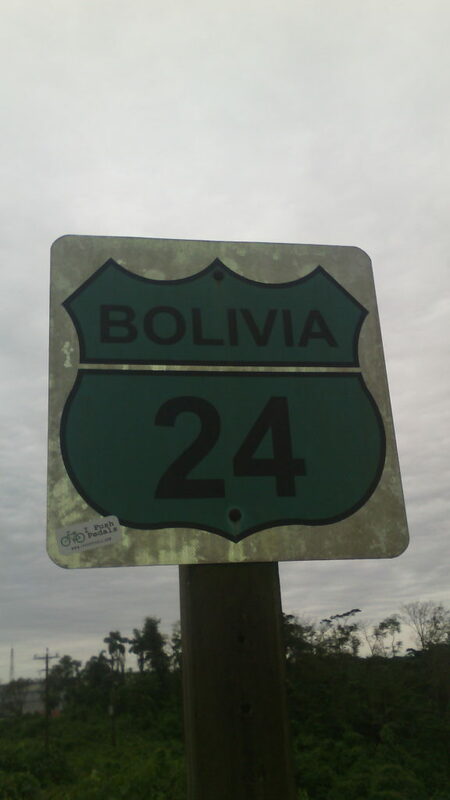 A not well known Bolivia. There were two main options; Puerto San Francisco and Puerto Villarroel. Juli’s german map would show roads that later we found out did not exist. So finding about boats crucial to save time in order to go towards El Beni and then further north El Pando. It was that or take 800 extra kilometers of road to reach a destination that it was only 400 kms away by river. Bus or plane was not on my options. 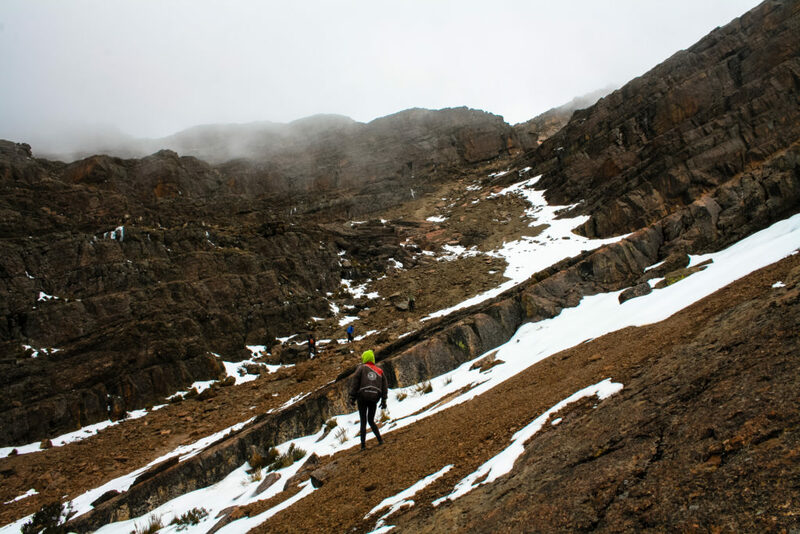 Climbing the Tunari Peak (5100 m.a.s.l.). One of the many things done while in Cochabamba. Puerto San Francisco lays in the middle of a dense jungle. It’s the end of the road as it is a port. In the older times many boats would come and go from this place. It was only 30 kilometers detour from the main highway and I thought that it could be done just in a couple of hours. Not very far away and I could reach the place, find about boats, and if no boat was to be found sleep in the area and leave early the next day. In a couple of hours I would be back at the highway and could keep towards Villarroel. Little did I know. The road towards Puerto San Francisco was a stoned road. Not a gravel road neither a dirt road but a stoned road. Now, it wouldn’t had been that bad if it were flat stones, like normal stone roads, but this is Bolivia and in Bolivia they make things differently. The stoned roads have rounded stones which are apart one from another and they also point upwards. So it’s not a road but many stones pointing upwards. For what I could see it was fairly good for cars and motorbikes. It was hell for the bicycle. Worst than going uphill on gravel roads. It was damn slow everything would move on the bike. Non stop. A constant crashing of everything. Bike, load, screws, bones, flesh, the whole body!. What I thought it would take only 2 hours top, it took 4 hours. I couldn’t go fast on such a road, it was impossible. Despite this hell I was going through to reach San Francisco, funny things that keep your spirit up happen when you least expect it. As I was moving through the stoned road the vibrations and the stones didn’t allow me to focus on anything but them. I heard some yelling but couldn’t really understand what it was and just kept on. Trying to avoid bigger stones and find some balance I couldn’t look at the landscape or people too much. I kept hearing the yelling and looked through the mirror and saw some kids running behind me. I stopped with the thought of letting them pass. They yelled once again and once they reached me they gave me a bag of lemonade. “So you can refresh a bit” said a tired boy. What the hell kids since when where you running?. “Quite a while sir” the bigger one replied. I thanked them a lot for the bag of lemonade and for running to give it to me. They didn’t ask anything so I asked them things and then they started to talk a bit more, the guys didn’t know what to say to me!. I gave them some pictures and stickers and thanked them a lot for the lemonade. I had to keep on. Road kept being hell. After 4 hours finally I reached what everybody told me on the way, The 21. I thought the 21 was a community, but it was the kilometer 21 out of 25 to reach Puerto San Francisco. I thought that San Francisco should be quite an important port to have pavement from the kilometer 21 towards the 25, town itself and end of the road. Or maybe there was a new road that would go towards El Beni?. I reached the town. End of the road indeed. It was almost dark. I needed to act quick to then find a place where to sleep. It gets dark around 6 pm at this latitude. I asked around some people for boats. They all said there were no more boats to El Beni. I didn’t pushed it much as I had to go find a place to sleep. I got demoralized. Paved road, but tiny village with no boats towards El Beni?. Why pave the last 5 kilometers to town then? You usually start from a main road towards smaller roads right? I started to roll backwards. I had already spotted a really nice place where to put my tent. 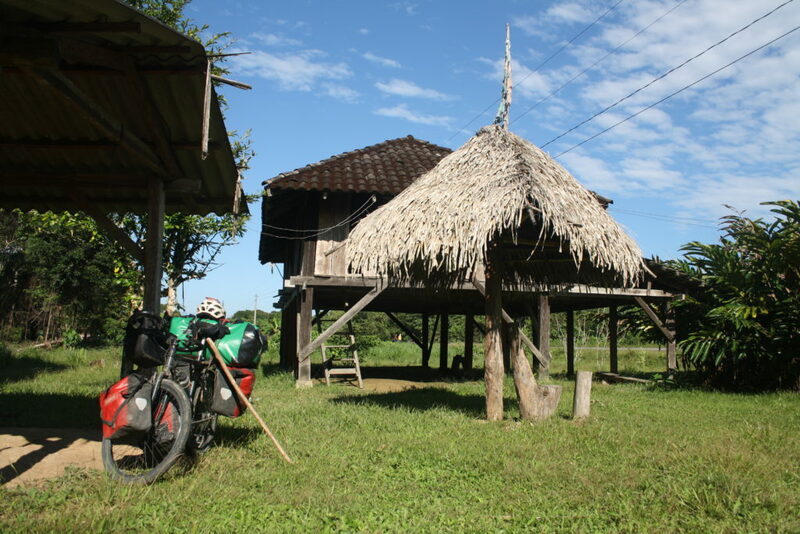 It seemed like a hut they used as shelter when working in the banana plantation or as the house many locals live at but with no people living in it. I went towards that spot to find out if I could sleep there. The spirit was quite down though, 25 kilometers of that hellish stoned road and I had to go back the same road again?. I was lucky the bike didn’t break on the way in. but now I had to go back. Damn it. I hate rolling backwards the same roads. I found the shelter I was looking for. It looked unmanned, grassy, open and perfect to spend a night there not bothering anyone and not being bothered by anyone. But there was a house in next land. As my previous experiences here in Bolivia have taught me, I decided to ask in the next house if I could use this spot for the night. I went there and yelled hello some times before a woman showed up. I told her that I was traveling and needed a place where to spend one night with my tent. Asked her if I could sleep in the house in the other land. The woman said I couldn’t, the house belonged to the president and I couldn’t sleep there, I had to talk to the corresponding authority if I wanted to use the house. The president wasn’t around and I couldn’t use the place. Damn, it was almost dark. I asked the woman if then I could put my tent on her yard. And then she said that if it was a tent I was going to use then I could sleep at the other house, no problem. I got confused and asked her again if then I could use the land of the house of the president with my tent, and she said yes. I asked then what about the authority I had to talk to in order to use the house and she replied that they also look for the house because she was also member of the local committee. No problema then!. I went back to the house of the president. I wondered if the president lived somewhere else like Villa Tunari or Cochabamba. Maybe he was the president of the committee of something important and had to relocate to another village. President of the local farmers, local fishermen, who knows. Well, he was not there and I could use the spot for the night. There was a small roof where one could make a fire and even a water valve which had potable water!. Fantastic spot and well kept. Grassy and clean, perfect for a night spot and even better than many paid campings. I wondered if I could use the house itself which was a second floor away from the humidity and the insects that may crawl in the night. Nobody was around and I could put all my things up there and only sleep with the mosquito net. Bike would stay downstairs with the lock and what a night I would have. No problema! I made camp in the second floor. I cooked, had a descent meal and some tea and got ready for the night. It was already late and time to sleep. I was getting into the sleeping bag when I saw a flashlight approach through the road. I waited to see if it would pass or get into the house of the president. It got into the house. An angry man yelled; “Who is here? Why are you here? You are not allowed here. You have to leave right now”. What the heck? 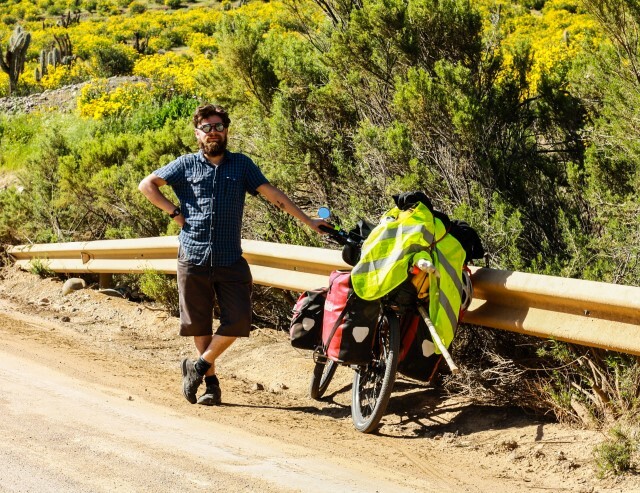 I told him I did not know anyone there and that I was traveling with the bicycle. I told him about the boats and how I had come to the place to find out about the boats. He started to stare at my bicycle and told him to come upstairs if he wanted to see my things so he knew I was not lying. He came upstairs and looked at my things. He was sort of amazed. He told me I had to talk to him if I wanted to sleep there, and that his wife had told him there was a man sleeping there. He told me that the president left him in charge of the house and told him no one could use it but that if I was going to be there just for the night not actually doing any harm I could stay. The president, the president, who the hell is this president?. I asked him; “And where is the president? Who is the president?”. “Evo Morales Ayma pues! Our president!” he proudly and annoyed replied. I couldn’t but laugh in awe. The house of the president and the president was the very president of Bolivia. The man told me how Evo Morales had arrived to this part of Bolivia when he was young and started a life there as many people from the highlands did it on the time. They left the harsh enviroment of the mountains and sought for better lands for farming and new opportunities in a strikingly different part of Bolivia. Evo did the same when he was young and there he settled for many years where he rose as revolutionary and an active member of the local politics while also being a farmer. For some minutes I couldn’t really believe it. I talked to the man for quite some time, we talked about my travels, how I got there. About the roads on Juli’s map and the boats. We talked about politics. We talked about life in Chile, life in the country side and life in the city. We talked many times about Evo and his life there. And then the man just told me to keep asking in San Francisco for a boat, there could be one and if I had to spend another night in the area I could do it there. I told him I would let him know if I stayed. Otherwise Puerto Villarroel was the next try. He left back to his place. I didn’t really know how to feel about where I was. I was sleeping at what at some point was the house of Evo Morales. Well it still is as he kept it and didn’t sell it. The house of the president. Such a humble house. Such a simple place to live. I would live there definitely. For a while at least. The mosquitos would get me tire quite soon and I still prefer colder environments. But for a while it would be fantastic to live there. The house of the president Evo Morales. Next day I went to San Francisco again. I had no luck with the boats. Null chance of getting something to go to El Beni. I had to go back the 25 hellish kilometers back to the main road and then back to the main highway to try at Villarroel. 4 hours of hell again. Hopefully the bike wouldn’t break on the way back. At least I had had a nice night. How couldn’t I? I slept at the house of the president. Ahahah ! What a unique story! Soethibg to remember for ever! Wow, what a twist at the end, the house of Evo! 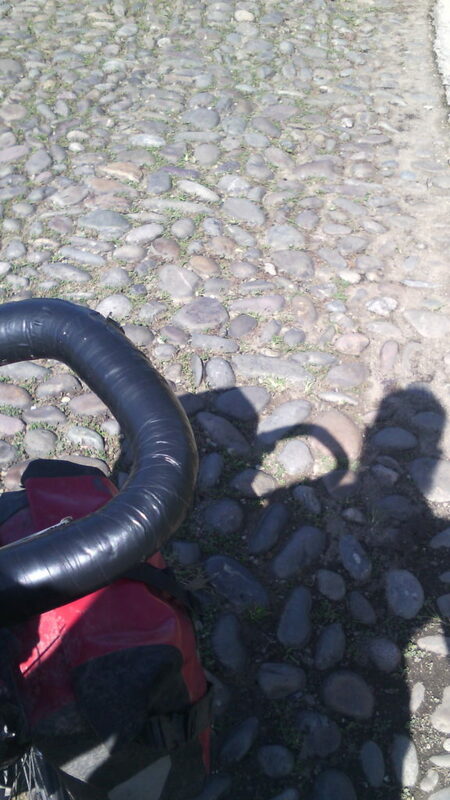 Great tales O’car, sorry to hear about the hellish road though, the cobblestoned road sounds awful. Love that the kids came to help you! !